Hanging out in the exhibit! 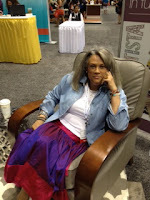 I've been so busy dealing with my health and trying to keep me together I haven't been able to blog about my experience this year at BlogHer. It was wonderful!! I got some wonderful aha Moments, got to meet lots of bloggers. That was some of the best, connecting to people who have the same passion as you. There were lots of parties, great food and tons of companies, of which I'll be sharing with you over the next few weeks. I even have a few raffles for you as soon as I can play follow up! Other than being one of the keynote speakers, meeting other bloggers and sharing ideas, the other cool thing about BlogHer are the companies there, sharing information with us to give to you. Now, you know I'm not a big reviewer, other than tea and books, but I will share some of the companies I liked the most and thought interesting. I was tickle pink to see Peapod! I like this company. I lit up like a Christmas Tree when win a gift certificate from their pin-a-wheel game. Yes, Lawd, free groceries! Then I came home and with my health issues, I forgot! How does one forget a $100 bucks? *Blank Stare* Well, I'm redeeming myself so I can redeem my gift card. LOL! "It's hard out here for a pimp," as the song goes. Seriously, it was great to see a familiar company at BlogHer13. 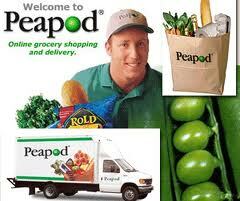 I like Peapod and have used them countless times. Remember back a couple of summers ago when I was on/off IV medication and had nerve pain everywhere? Well, walking was a challenge and honestly Peapod came in handy. It was simple. I would order one day and the next day all my groceries arrived. Now, I was really skeptical because I'm a touchy feely kinda girl. But truly, all the food was fresh and as described. I even discovered new foods, especially prepared foods which was needed, because cooking was also a challenge. I even discovered that one of my favorite restaurants, Wild Fire had frozen foods. Who knew? There are always sales and the neatest thing is that they keep a history of your previous shopped items. You didn't even have to think, your favorites are there waiting on you. The drivers were always punctual and courteous. 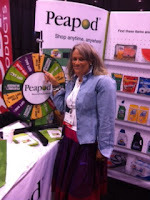 Yeap, overall I really like Peapod services and I was glad they thought enough of us bloggers to show up! I'm really excited about this gift card and to have my groceries delivered in all this darn heat in Chicago right now, right to my door! !